The routine 15 to 45 minute walk around the neighborhood is sufficient for getting your body moving after a long day of sitting while satisfying your restless dog. 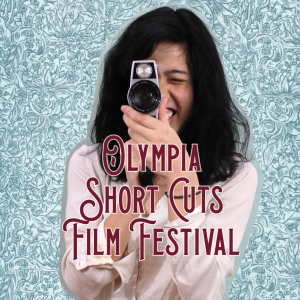 But did you know City of Olympia has over 900 acres of parkland to explore? With long summer days, a furry friend, and a bottle of water, it’s time to check out some of the best dog walking areas Thurston County has to offer. Who knows, you may just stumble upon something amazing. But please, always bring the pooper-scooper bag so that no one will be stumbling into … unwanted “presents” left behind. What’s more, make walking your dog a social event. Combining scenic areas and exercise, it’s the perfect activity for a low-key date or catching up with old friends. 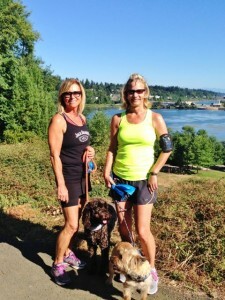 Candice Rydalch and Cathy McNamara love walking their dogs Bogey and Indy, respectively, around the lake and up the switchbacks. Most Olympians are familiar with the 1.5 mile relatively flat walk around Capitol Lake. However, this lake loop in the heart of downtown Olympia can be spiced up quite a bit, depending on what it is you’re looking for. Dog walkers hoping to tire out their pooch and simultaneously tone their calves can add on the 0.5 mile Heritage Park Hillside Trail, a series of moderately steep switchbacks that lead from the lake up to the historic Capitol campus. Make it Romantic: One young couple, Kevin Tran and Jessy Turnbull, pack a picnic and walk Kevin’s dog Ikey, a Chow Chow, to the top of the hill where they enjoy the panoramic view and good food before walking back down again. “We both love to be outdoors and in motion so this is the perfect activity for us,” said Kevin, who actually lives close enough to Capitol Lake to walk the whole way – no car necessary. However, if you do need to drive, free parking is available on the Deschutes Parkway, a 1.68 mile state-owned roadway that threads along the western shore of Capitol Lake. Add Length: Unknown to many, the Capitol Lake walk can actually be extended in many directions. In the southern direction, dog walkers can follow along the shaded, lush Deschutes Parkway and pass by Olympia’s Interpretive Center for an extra 4 miles (round trip). The only downside being the proximity to the cars, as this path is right along a main road. Those interested in being close to the water can venture in the northern direction, strolling along the boardwalk to reach Percival Landing (0.9 miles). See map here. 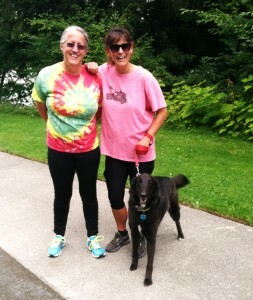 Cheri Keller and Molly Knutson-Keller, sister in-laws, love taking Molly’s dog on an extended walk along the Deschutes Parkway. For a short nature walk, the Historical Tumwater Falls is the place to go. The walk encompasses a half mile of beautiful waterfalls, sloping walkways, and two viewing bridges. There is free parking at the park entrance, as well as play structures and restrooms. If you have an older dog who can’t walk as fast or needs to take breaks every now and then, the two of you can tag along on a free guided one-hour Riverwalk Tour that will “bring life to Tumwaters pioneer era.” The walking tours take place from 10:30 am to 11:30 am on Wednesday and Fridays from July through September. If you’re looking for a harder workout and would like to run with your dog, the 5 mile round-trip Olympia Woodland Trail is perfect for you. Featuring a 10 foot wide, flat trail with restrooms, benches, and over 12,000 native plants, you’ll have ample space, resting area, and natural distractions to make your run successful. What’s more, you can extend the route in two directions: continuing onto the Chehalis-Western Trailhead (east end of the trail) or entering the Watershed Park (western end of the trail). See map here. Want more paved trails? Try the two walking loops at the Rainier Vista Park (Loop A is 0.7 miles and Loop B is 1 mile). 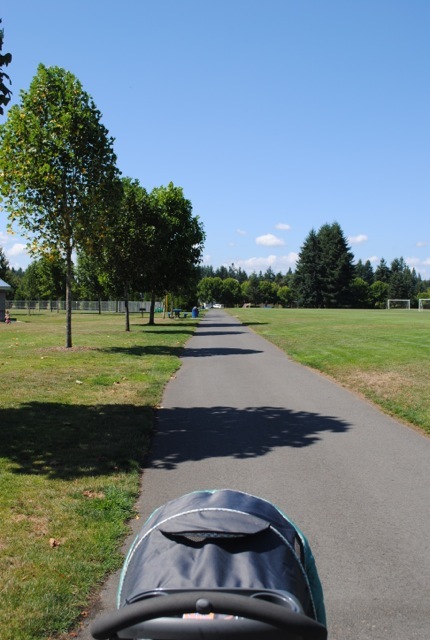 Get more information by checking out Best Spots in Thurston County for Stroller Walks. 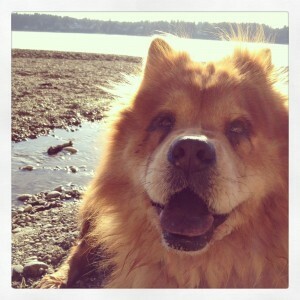 For dogs who love to splash around in water, the Priest Point Park trail is a great place to go. 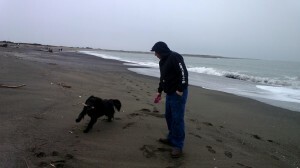 Washington beaches tend to be very dog friendly. The main trail is the historical Ellis Cove Trail (3.0 miles round trip), which offers a myriad of carvings and signs – in the shapes of salmon, orcas, bears, and other wild animals – directing attention to the park’s landmarks. Bear in mind that this trail is moderately strenuous, at times exceeding a 10% grade, contains stairs, and is best visited at low tide. For those venturesome souls, there is always the possibility to chart your own course, which often involves finding a path down to the beach and then walking along the water. I recommend wearing shoes that can get dirty and expecting to give your dog a bath when you get home (there is a definite possibility of mud). If you’re into beaches, also check out Olympia’s hidden gem, Frye Cove, which encompasses two miles of trails. If you’re there at the right time, you may just catch a wedding at this popular venue. This short trail is calm, cool, and very, very green. Personally, I love taking my dog on runs around the 1.36 mile loop – the trail is the perfect width (about 7 ft), not crowded, and full of fresh, cool air. What’s more, the route can easily be extended by continuing on to the Olympia Woodland Trail (see above). The park has four trailheads, three for pedestrians – meaning you can walk your dog to the park, never having to go through the trouble of getting your dog in the car – and one parking entrance on Henderson Boulevard. See map here. 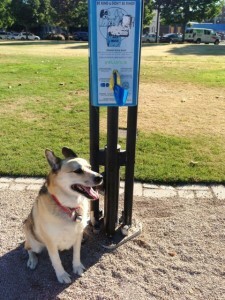 Standing proudly beside the pooper-scooper bag box, Surina, an Akita German-Shepherd mix, shows her support for owners picking up after their dog. If you live on the Westside, then the Garfield Nature Trail is a short 0.35 mile walk to get you and your dog some fresh air. The green, wooded path is home to a variety of animals – like squirrels – that are sure to capture your dog’s attention. The trail was designed to act as a path between the Westside neighborhoods and West Bay Drive. See map here. Dog walkers wishing to extend their outing can continue along West Bay Drive which runs parallel to the shoreline and connects to the West Bay Park trail. Here you and your furry friend have access to the beach and enjoy spectacular views of the State Capitol, ship canal and Olympic peaks. See map here. Most Olympians are familiar with LBA park near McKenny Elementary School. It has multiple baseball fields (in fact, the parks name, LBA, is short for Little Baseball Association, the organization that donated land so the city could build the park), restroom facilities, a parking lot, a play structure, and a 0.7 mile bark-paved path (see map here). But what’s more unheard of is the LBA Backwoods, the wooded area that has multiple paths with easy access from the walking trail. For the adventurous souls, it’s the perfect place to explore – just be careful not to get lost. Early morning dog walkers might even get a chance to cross paths with the Olympia High School cross country teams as they run mile after mile in the cool woods. Karlee and her husband Jeremy take their German Shepherd Lab mix Chloe out to Skookumchuck Unit for long walks and beach fun. A little out of the way, the Skookumchuck Unit is the perfect “get-away” walk, where dogs are welcome and may just rub noses with the occasional horse on a trail ride. Consisting of prairie, farmlands, orchards, meadows and forest, the 960-acre Skookumchuck unit seems to have it all and is located 11 miles northeast of Centralia. This is another great dog-walking date-spot. In fact, Karlee Keith and her husband Jeremy confess this is one of their favorite places for a romantic adventure. “We love throwing our dog Chloe, a German Shepherd Lab Mix, in the back of our truck, coming out to Skookumchuck, and getting purposely lost,” said Karlee. “There is a huge open field where she run from one end of the field to the other and can tire herself out.” They especially love coming in the summer when the river has receded enough that they have a plentiful array of sand bars to sit on, while Chloe splashes in the water and fetches sticks.